The author, a seasoned rubber technologist of four decades, provides more than 180 essential rubber formularies, some of which have never been published, that are used by practitioners the world over on a frequent basis. A special feature of the formulations is that they are designed for factory scale applications. The opening chapter of this indispensable book gives practical information on compounding techniques, coloring, ingredients, as well as a whole section on typical rubber testing methods. The book concludes with appendices useful for the technologist that include seven conversion tables and three tables on scorching of rubber, specific gravity and volume cost, equivalent chemical names for trade names. Designing a rubber formula on the factory floor demands knowledge of the whole undertaking, such as the physical nature of ingredients, the interaction of additives and the base rubber during compounding and processing, as well as making sure that the finished product conforms to specification and requirements. This book provides all the necessary knowledge for practitioners and students alike. Rubber chemists and compounders in industry wherever rubber components are manufactured. 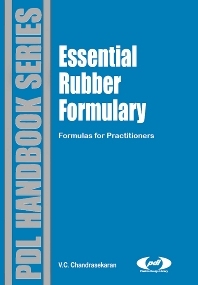 Rubber formulators will find this book as useful as any in their collection.